I can't believe it is already time to reveal April's book. I have to admit that I have been on the fence and nothing quite struck a chord with me (and y'all were all torn on last month's feedback too). But I came across a book that the description struck a chord with me. (Finally!) And I believe that it is not just a title, but a message we will all find a big deep breath in. 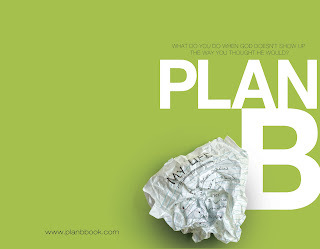 PlanB Promo from Cross Point Church on Vimeo. You can purchase it on Amazon HERE. It is available on the Kindle too! I so hope you will join us! Regardless of what season in life you are in right now, we have all felt the _(fill in the blank)_ of what it is like for things not to go as Plan A had so perfectly laid out. And for vote off for May (I think we will start doing this each 15th as well): What fiction book should we read next? I have not a clue of what to recommend, so send in your ideas!